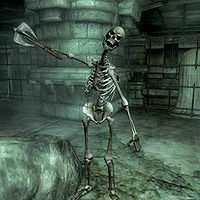 Warden Kastav is a Skeleton located in Sancre Tor, Prison. There is no evidence in the game of who he was in life, but from where he is positioned and the key that he carries, as well as his name, it seems obvious that he was a prison guard in his better days. This page was last modified on 25 December 2013, at 21:48.